I want to start a new addition next week to my website. Last week, Kevin, my new internet guy here in San Diego won the interviews from our listing on Craigslist that Victoria posted, then interviewed during one of her visits here. Kevin was studying and learning the SFG system as fast as possible and he asked a friend to go to our http://www.squarefootgardening.org website to see if he could learn about and understand how the system works. Unfortunately, astonishingly and embarrassingly the answer came back, “No, not really.” He didn’t have the book and although there is a ton of information on our web site, it apparently doesn’t tell a beginner what SFG is about and how you do it in a clear direct manner. It is an excellent site for experienced SF gardeners – many have complimented us and we have won many awards but this was a revelation from a person just walking through the front door and wondering what is SFG all about. Sooooooooooo, I am going to add a BEGINNER page to my blog and website to satisfy that need. If it works, we can always move it to the main Square Foot Gardening site. We’ll start you off with a twofer for this week, and stay tuned for part 3 next week! Why Did Mel Invent SFG? I just learned about SFG this weekend and have been looking for a how to beginners guide. This is great. Thank you so much for your letter. Can I ask where you heard about SFG? I am always interested to know how people are learning about the method. I will have more beginner’s guides coming out as the months go on, but if you want the absolute crash course in SFG your best bet would be to grab a copy of the ALL NEW SFG book. You can get it from our store at http://www.squarefootgardening.com, or most libraries also carry it for free if you want to go that route. Thanks for your interest and good luck in your journey! We are hoping to use your SFG at our homeless transitional house, here in Lee’s Summit, MO (Hillcrest Transitional Housing). How many bags of each component (peat, verm, and compost) would it take to fill up a 4×4 box? Even an estimate would help. I’m not sure how big typical bags are and how many it would take to get the additional 6 inches needed. Thanks for your letter. It’s just great that you are using Square Foot Gardening at a homeless transitional house. We are actually in the middle of a SFG project teaching the homeless how to provide for themselves here in San Diego, California. We’re also doing a transitional center in Columbia, South Carolina. To answer your question, a 4’x4′ box is 6″ deep, so that is 8 cubic feet. Since you need 1/3 of each of the components, you would need around 2 & 2/3 cubic feet of each. That’s around two bags of each. Not all ingredients come in the same size bags, so it gets a little difficult to make sure you have the right mixture. But if you go to chapter 5 of the ALL NEW SFG book it goes into quite a bit of detail of how much of each ingredient you need, how to figure that and then how to shop. Hopefully, that’s all going to be over soon because we have a company now that is making Mel’s Mix and selling it in Lowes and Home Depot in different areas around the country. Please call them and see if they have it and that would save you a lot of figuring, shopping and mixing. If you find the Mel’s Mix it’ll be in 2 cubit feet bags, so it’s easy to do the math. Also, please keep in touch with us because we’d like to get more transitional homeless soup kitchens to start Square Foot Gardens and not only provide some of the food, fresh and nutritious, but also teach everyone to grow their own. Also, send some pictures of your operation! The idea would be that some of those that come to recieve the free food would be willing to put in a few hours of gardening as a thank you as well as learning how to become self-sufficient at their own location. We would encourage by way of this letter, to ask all of those in the country working with homeless, hungry, and veterans to get in touch with our nonprofit foundation for ideas and advice on how they can start something in their own community. I have a large patio with average bricks. Last fall, I took out enough bricks in a sunny location to create three 4×4 raised beds. I covered the sand with a layer of organic manure compost for the winter. Being that it is sandy soil, is 6″ enough depth for the bed? I plan on growing vegetables and herbs. I’ve been gardening for years, turning the soil, etc. I have your original Square Foot Gardening book, and absolutely cannot wait to garden this year! Thank you for your letter. I’m just a little confused with your letter and your raised beds. You have a patio that you’ve taken bricks out of. That means you have a whole 4 x 4 and of course the bricks are sitting on top of sand, and then you said you’d covered that sand with a layer of manure, compost, for the winter. That’s okay. Maybe the term “raised beds” that you created is a little confusing. It seems like they’re in a hole in the ground. But let me cover some other points to help you out. Because you’re putting your raised bed on top of sand, it won’t matter at all, in fact it’s much better because then any excess water can drain right, straight down. Should you put down a weed fabric over the sand before you put in your Mel’s Mix – will any weeds come up through the sand? Have you had any problem with weeds on your patio before? If so, I would put a weed fabric down at the bottom. How deep is the manure compost? Or were you planning on taking that out? You say you have the original Square Foot Gardening book. I want you to get the ALL NEW Square Foot Gardening book because there’s been ten major improvements in the system since 30 years ago when the original came out, and I think you should have that brand new one. Check at the library or order it right through our website, http://www.squarefootgardening.com. If you make the Mel’s Mix according to formula, or now you can buy it in bags, check your Home Depot and your Lowes. Ask them if they have the Mel’s Mix all bagged. I notice you said you’ve been gardening for years. That’s good. Turning the soil, that’s not so good, because it’s a lot of work and the new all new Square Foot Gardening eliminates total digging, there is no digging whatsoever. There’s no weeding either, there’s no rototilling, there’s really no work to it anymore. Once you put in your six inches of Mel’s Mix, according to the formula, it’s all in the book, that’s all you need probably for the rest of your life. Remember, if you’re up to date on the new method, you add a trowel full of compost to each square foot as you replant it with a different crop, until you’re continually adding compost. Once you’ve added that extra compost, each square foot each time you replant, that’s all there is to do and your soil will last forever and ever. I’m not sure what state you’re from, so when you say you absolutely can’t wait to garden this year, I don’t know how long you’re going to have to wait. But when it comes around, stick with the book, follow the system, and you’ll be very successful. Thank you so much for your letter. I hope those answers explain everything to you. I have four lovely 4×4 beds waiting to be planted this spring. I have read your book cover to cover and then gone back to read some sections again. 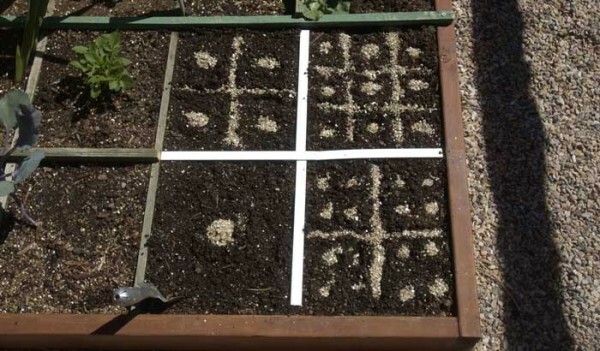 I am getting ready to start some seeds here in Wisconsin and I wondered if you have ever used a soil cube with Mel’s Mix. The soil cube appeals to me because there is no waste but I would hate to buy it and find out Mel’s Mix doesn’t work. Also, if Mel’s Mix won’t work, would using their prescribed soil mix to make the cubes then affect the integrity of the mix of soil already in the beds? Thank you for your excited letter about getting started with your new SFG beds. Do you still have snow out your kitchen window? Nicole, when you mentioned soil cubes, there are many on the market so I’m not sure which one you’re talking about. Sometimes they’re just like a cup and you fill it with a soil mix. Others you have a template or sometimes I’ve even seen people take the empty toilet paper roll, cut it in half and then stuff that with soil. I think that’s what you mean by using Mel’s Mix to make a soil cube and yes it should work very well. The only problem would be if you’re packing it down you’d crush the vermiculite but you’re just starting seeds and they’ll still get off to a good start. As far as making your cubes from “their” prescribed soil mix, that won’t affect the integrity of the soil mix already in the beds. And I’m assuming you have mills mix in the beds. Please confirm that for me. For the things that you’re probably starting like peppers and tomatoes and the cabbage family, you’re not adding many cubes, actually only one per square foot so that wouldn’t matter. Sometimes we see soil mixes with perlite instead of vermiculite and if you read in the book why I don’t like perlite you’ll see why I don’t like adding it. But we’re not talking about a big amount so unless you’re putting big potted plants in that contain perlite I wouldn’t worry about it. I hope that helps. If you have any further questions please let me know. Thank you again for your letter and happy gardening. We do still have a bit of snow outside but it’s been a rainy day and a mild winter in general so I am able to think of spring. This also shows a picture of the device. My main concern is that Mel’s Mix (which is what I have in my beds) is so fluffy and loose that I was not sure it would compact into a cube and hold together. I posed the same question to Steve Howard at Growing Your Grub (podcast). He replied with the following…. Congratulations! Square foot gardening is a great method for getting the most food out of less space. While the soilcube.com looks like a nice device, I prefer the ones from Johnnyseeds.com for a couple of reasons. They are about the same price and are available for a wide range of sizes allowing you to produce cubes much more quickly. For example, the smallest one has 4 cubes from one tool. Cubes are available from inch to 4 inches in size. This allows you to move easily from a smaller cube into a larger cube if necessary. I would avoid the tray, because although it looks nice, it will be filled with water to keep the cubes damp, and would eventually rot out, even cedar. As for the mix, I was unable to find their recipe, but the important thing in a seed starting mix is to have a sterile mixture, whether you mix it yourself, or purchase a commercial starter. So if their method talks about ways to sterilize the mixture, then it should be fine. It needs to be a sterile mixture because starting seedlings are very susceptible to fungus and other diseases that are in common soil. It will not need any sort of plant food or fertilizer. The seed carries the food for the plant in it, and is enough to hold it until it emerges. I generally buy commercial seed start mix for my plants. Johnnys has larger sizes if you need large quantities, but I would advise using your local stores first to avoid shipping costs. And finally, no, I don’t feel it would “contaminate” your Mels mix. Whether you buy commercial seed starts or start your own, when planting them they will blend in fine, don’t worry about it. I have done this many times. Mels mix is a terrific mix to use for a raised bed, and I have used it in many applications for great success. All i do is bring the bed back to correct levels in the spring after adding lots of good compost. I hope that helps a bit, and remember, this is just my opinion and what has worked for me. Thanks for all of the information. I would agree partially with Steve that it is most important to have a sterile soil and I remember getting in trouble with my wife in the kitchen stove doing just that. It smelled up the whole house and I thought, “I’ll just take my chances the next time.” You can still use Mel’s Mix and not worry about it being compacted, because you’re using it for a purpose. Then you don’t have to buy all of that other stuff. It would definitely compact the Mel’s Mix ingredients, but that doesn’t matter because you’re using so little. The cubes, after being planted in the garden, will eventually come apart and eventually become a part of the mix. On the other hand, if you’re concerned about using Mel’s Mix for the food, go ahead and follow the directions on all of the other materials to use. I would personally start a small batch of seeds using Mel’s Mix and see what kind of results you get. Good luck and let us know how things turn out.